When i was 15 years old and came out as a lesbian my mother said " I am going to take you to this festival in forest park, so you can meet your people" being in community in the late 80 was vital to my survival and feeling part of our movement. When i came out as a transgender man in my early 30' s in the mid 2000 i was at a loss on where to meet my people. This is not to say that there has not been many trans folks at pride throughout the years we just may not have been as visible or organized as some of our L and G and maybe B family. We feel like it is now our turn. 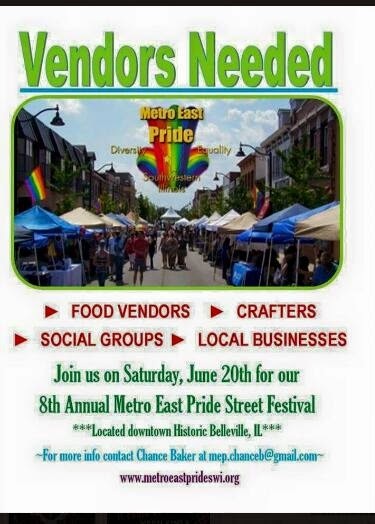 BellevillePride~ MetroEast News shared SAGE (Services & Advocacy for GLBT Elders)'s photo. Congrats Sherrill Wayland, no the rest of the nation knows an advocate we have appreciated for a long time! Thanks for all you do. Major congrats to Sherrill Wayland, Executive Director of SAGE Metro St. Louis for being awarded the 2015 Harvey A. and Dorismae Hacker Friedman Award for her outstanding contribution in service to older adults! Great work Sherrill, you deserve it! Equality Illinois is holding our annual LGBT Advocacy Day onWednesday, April 15 at the Illinois State Capitol in Springfield. It’ll be a great opportunity to talk to lawmakers about legislation that affects the LGBT community. Our agenda includes strengthening hate crimes legislation, protecting LGBT youth from ineffective and dangerous conversion therapy, and saving important funding for public services in the state budget. 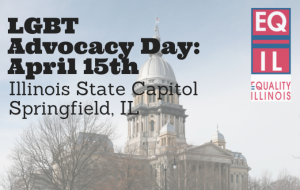 Registration for a bus ticket from the Chicago area includes admission for one round trip to Springfield, lunch, and registration to the LGBT Advocacy Day. Or you can drive on your own from anywhere in the state and participate in our program when you arrive. Share your plans on social media with #LGBTadvocacy. It gives us great pleasure to announce that Chance Baker was voted in and he has excepted the position of Vice President of MEPSI. His past leadership on the Board and enthusiasm for this community is exactly what our organization needs. Congrats Chance. We are so happy and excited for this new chapter. Tristen Lennox The more things change the more they don't change at all. congrats chance and all of the yesteryear leaders. He is an exceptionally awesome leader and organizer. He will certainly be an asset to this organization. Breaking News: Governor Bruce Rauner holds first meeting with LGBT leaders, commits to strict enforcement of non-discrimination laws and appoints liaison to LGBT community.